Over three weeks this July and August, Archaeovision completed one of our largest recording projects to date, on behalf of the University of Lancaster’s Digital Humanities Hub and Manx National Heritage. The project, to laser scan all Early Medieval stone crosses found on the Isle of Man, used blue-light laser light scanning technology employing a FARO Edge Arm Scanner with a REV6 HD Laser Line Probe (LLP) attachment. This particular set-up allows for an extremely high resolution product: the accuracy of the scanning system is ±25 microns (μm) and is incomparable to other recording solutions. Since capturing the data, Archaeovision has been hard at work processing over two terabytes of raw scan data. Each cross recording produces a point cloud, or set of data points in space representing the external surfaces of the object scanned. These point clouds range in size from about half a million points to more than a billion points, depending on the size of the stone cross. These raw point clouds must undergo a series of processing steps using a myriad of software to create a final product. First, the data is manually cleaned of unwanted points (i.e. sections of walls or floor which are not relevant to the stone cross). The data for some of the crosses, which were recorded in two or more sections, then need alignment to register the separate point clouds with each other. This is a manual process and requires selecting three (or preferably more) overlapping points between the two scans, allowing for the software to create a more precise alignment. The point clouds are then saved as multiple files: PTS, WRP, and ASC. A PTS file is compatible with AutoCAD or Cloud Compare, among others. A WRP file is used in Geomagic Studio, and an ASC file is a universally-accepted format of a series of xyz coordinates. To create the fully textured (i.e. the technical term for photorealistic colouration) model for public presentation, the point clouds needed further processing, most importantly meshing, decimation, and texturing. Meshing refers to an action which converts point clouds into more practical triangular meshes, in our case using the quadric edge collapse and Poisson surface reconstruction methods in Meshlab. Because the point cloud files are far too large to share on a public 3D platform like Sketchfab, they must be decimated to about two to five million faces depending on the physical size of the cross. Once the models are meshed and decimated, the process of texturing begins. While recording the stones on the Isle of Man, pictures were captured of every visible and accessible surface of each stone, resulting in over 1,000 photographs. These pictures are then imported into the texturing software and individually aligned to each relevant portion of the stone. This perhaps is the most time-consuming and labour-intensive portion of the processing. These files are then saved and imported to Sketchfab for the public. 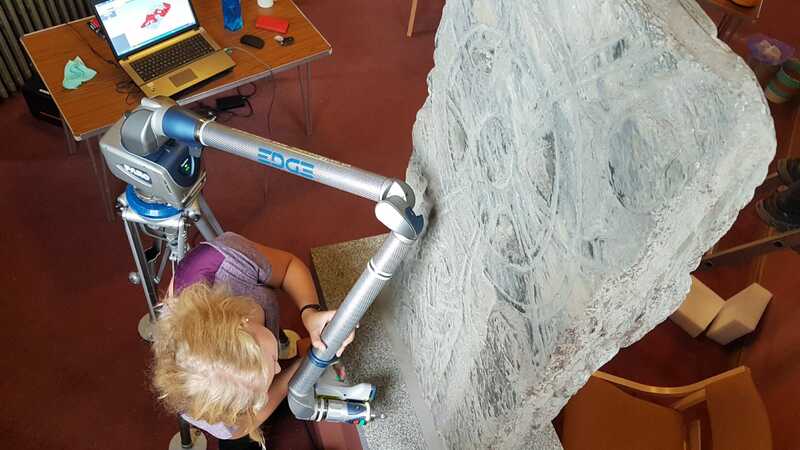 The results of the recording provide an electronic corpus for the Manx Crosses to Manx National Heritage, creating a benchmark for conservation from which to measure degrees of deterioration of the stone material in the future. The data captured has been made publicly available, allowing those interested to view and manipulate the 3D models online at Isle of Man’s iMuseum. Below is just a small selection of the stone crosses. Gianna is a GIS/CAD Specialist with over 7 years of experience in terrestrial archaeological investigations and reporting, including excavations and research at Pompeii and Stonehenge. She graduated with Distinction from the University of Southampton with research specific to the visualisation and quantification of change through time using GIS and CAD. She has conducted all phases of archaeological research to guide clients and agencies through compliance. Gianna is relied upon for the production of desk- and field-based archaeological assessments, predictive models, and graphics for inclusion in proposals and final reports, conducting fieldwork, on-site monitoring and survey work, directing field activities and supervising and training project employees, including in-house, external contractors and sub-contractors. Gianna now leads on UK recording projects and assists others in the company in managing our large web projects.